During the dog-days of summer, locating the muskies during the day is essential to setting them up to for an after-dark catch. Jim Saric and Pro Guide Mike Hulbert demonstrate how to convert day-time follows to night-time catches. 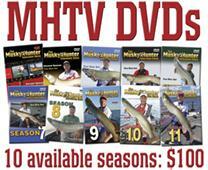 Your ultimate musky fishing success depends upon sound fundamentals. Jim Saric, Pro Guide Mike Lazarus and Trophy Hunter Tom Sullivan discuss the importance of sound fundamentals while battling big muskies. Every spring can be unpredictable, and fishing patterns change annually. First, Jim Saric and Pro Guide Chad Cain troll a southern reservoir in flooded conditions. Then, Jim Saric and Jim Stewart from Rollie and Helen’s Musky Shop discuss early season lake hopping strategies. The traditional approach to fishing most spots is to focus on the outside edge and to cast from deep to shallow. However, in early summer, focusing on the top of structural elements, the inside edge, and changing your casting approach from shallow to deep can have big results. Jim Saric and Trophy Hunter Tom Sullivan explore alternative approaches to fishing traditional spots. Tough conditions sometimes require picking a couple spots and grinding it out rather than jumping from spot to spot. First Jim Saric and FCIS contest winner Marty Forman pound the weeds in early fall. Then Pro Guide Gregg Thomas joins Jim to grind it out for some giant night muskies. In fall, there is a migration of muskies following the forage up the reservoir and into creek arms. The channel edges are virtual musky highways. Jim Saric and John Mich detail the idiosyncrasies of fishing channel edges and the movement of muskies when the water temperatures drop. The first place to start on almost any musky water is the outside weed edge. This transition from the open water to the shallow cover is a major feeding area. Jim Saric, teams up with Brad Ruh and Dennis Lappen from Musky Innovations utilizing a variety of soft plastics to trigger strikes from deep weed edges. Summer days allow for long hours of musky fishing and to be successful you have to be willing to adapt to the conditions. That not only means changing lures, but switching between casting and trolling techniques. Jim Saric, Pro Guide Mike Lazarus, and Trophy Hunter Tom Sullivan embark on a casting and trolling mission in search of giant muskies. Musky fishing is much like detective work. You have to recognize the clues to determine not only where the muskies live, but how to get them to bite. First, Jim Saric and Rich Belanger from St. Croix Rods discuss eliminating options and the thought process when fishing new water. Then Jim Saric and Trophy Hunter Tom Sullivan detail a shallow sand pattern often overlooked. Once the muskies complete spawning, they may be located in shallow cover, holding on the edges, or suspended in open water. As conditions change the muskies can move on a daily basis. Jim Saric, Managing Editor of Musky Hunter Magazine Steve Heiting and Pro Guide Mike Hulbert discuss the movement of muskies after the spawn while fishing a variety of spots. As the water temperature drops in fall muskies leave their summer haunts and follow bait to warmer water, and begin staging in the vicinity of spring spawning areas. Trolling is your best option to contact these roving packs of muskies. First, Jim Saric and Steve Miller from Mercury Marine troll a large flat trying to maximize lure coverage. 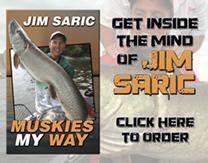 Then, Jim Saric and Pro Guide Dennis Radloff troll a river mouth loaded with bait and roaming muskies.